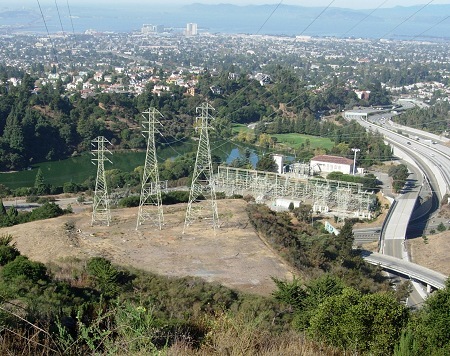 Oakland’s infrastructure includes two major powerlines across the hills. One starts from the 1922-vintage substation on Landvale Road (the Claremont Substation) and runs parallel to route 24. The other starts from the vintage substation at Park Boulevard and Grosvenor Place (Substation X) and runs up Indian Gulch, Dimond Canyon and Shepard Canyon. Both of them offer little islands of open land, secret parks, around the support structures. This idyllic spot, photographed in November, overlooks Indian Gulch between Hollywood Avenue and Glendome Circle. 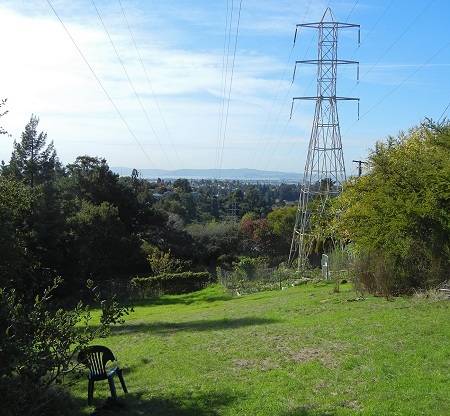 And here’s a view of the Claremont Substation and powerline just east of Lake Temescal, taken in October 2008. This bit of empty land can be reached from the top of Pali Court or by a scramble up from Broadway or another scramble down from the fire road past Swainland Reservoir. This entry was posted on 7 January 2013 at 9:06 pm and is filed under Oakland geology views, Other topics. You can follow any responses to this entry through the RSS 2.0 feed. You can skip to the end and leave a response. Pinging is currently not allowed. Do you know anyone who would make this kind of newsletter for Mendocino County? I would love that! Even better, maybe you’d write it on regular forays to our beautiful, relaxing rural county.